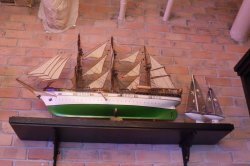 When you walk in to Fremantle Seafood Market, the pub-like restaurant will give you a very oceanic feeling, with lots of yachts used as decoration. 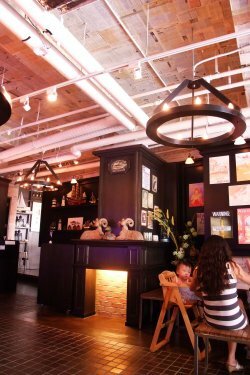 This place promises the freshest catch of the week, just like those freshest seafood you could taste at the Fremantle port in Perth, Australia. With $35++, you could enjoy a 3-course set lunch with the choice of starter, main and dessert, as well as a free Fremantle coolers. We have ordered Oyster Naked Trio and Lobster Thermidor Tart as starters. 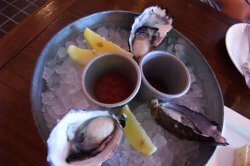 The trio oysters (each from Barron Point, Kumaoto and Hama Hama respectively) were served with 3 different sauces and they were awesomely fresh! 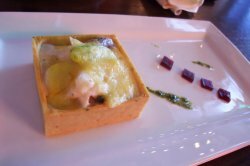 The lobster thermidor tart was flavourful. The generous amout of lobster flesh was cooked in the starchy seafoody gravy, and the tart was served together with asparagus puree abd beetroot jelly, one of the Aussies' favourite. Pan-seared king salmon was very fresh, though tasted simple. 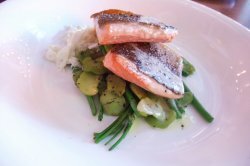 Although the salmon didn't quite have the 'wow' factor, but the side-dish was pretty impressive: cracking lavosh and bay shrimps, stew broad bean, and artichoke coleslow. The Seared diver sea scallops was served with Dungeness crab meat risotto, sugar pea and aged balsamic glaze. 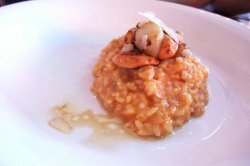 This risotto was not as cheesy as those I used to have, it's quite mild in taste I would say, however, because of this reason, you could really taste the seafood sweetness flavour. As for dessert, the lemon meringue was perfectly done! 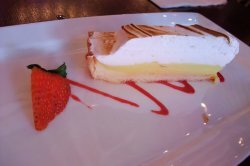 The meringue was fluffy, and the sourness of the lemon tart was just very well done. 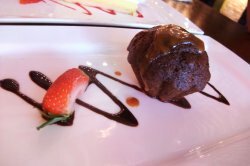 The chocolate date cake was a disappointment though. The cake didn't look pretty and it was pretty dry too, though the taste was quite Ok.